Tristan da Cunha is a group of islands located in the southern Atlantic Ocean , between the continents of Africa and South America . The main island of the group is known also as Tristan da Cunha and is often considered to be the world’s most remote inhabited island. Just 269 people live on this isolated wildlife haven. Due to the remoteness of the islands, their ecosystems have been largely preserved from human disruption, allowing wildlife to thrive. Two of the islands have been designated as wildlife reserves and have been inscribed by UNESCO as a World Heritage Site. The amazing island of Tristan da Cunha. Source: Grant Tiffen / Adobe . The Discovery of Tristan da Cunha? Tristan da Cunha is located about halfway between Cape Town , South Africa and Buenos Aires , Argentina. 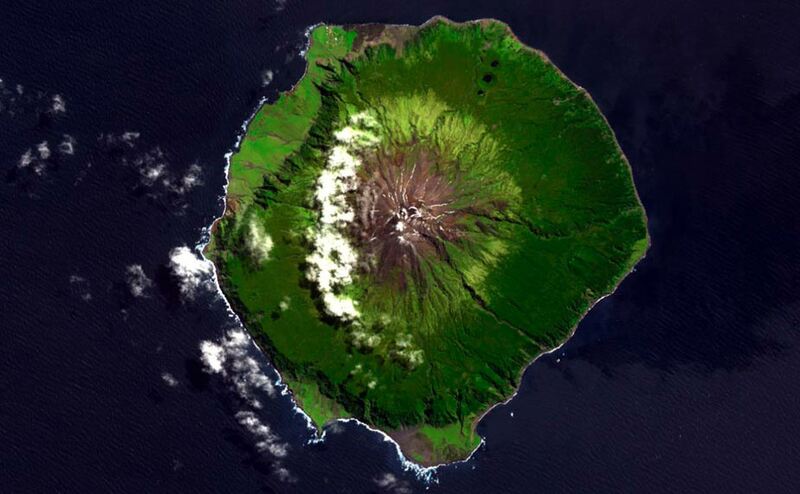 The group consists of six islands – Tristan da Cunha, Inaccessible, Nightingale, Middle, Stoltenhoff, and Gough. Apart from the permanent settlement on the primary island, Tristan da Cunha, and the manned weather station on Gough, the rest of the islands in the group are completely uninhabited. The estimated population of the islands in 2014 was 269, making it the most remote inhabited island in the world. Tristan da Cunha was first discovered in 1506 by the Portuguese explorer Tristão da Cunha, who was leading an expedition to India. Needless to say, he named the main island after himself. It is unclear, however, whether he actually set foot on the island or only saw it from his ship. Incidentally, Tristão da Cunha would later be appointed as head of Manuel I’s embassy to Rome, where he would pledge the Portuguese king’s obedience to the newly-elected pope, Leo X. The embassy was well-known for the gifts presented by the king to the pope, most notably the exotic animals acquired by the Portuguese during their trade missions in the East. After Tristão da Cunha’s discovery of the islands, there were plans by the French and Dutch governments, as well as the British East India Company , to take control of the islands. These plans, however, came to naught as no suitable landing place could be established. The first known inhabitant of Tristan da Cunha only arrived three centuries after the island was discovered in 1810, Jonathan Lambert, from Salem, Massachusetts , arrived on the island, declared himself emperor, and renamed the group of islands as the Islands of Refreshment. He decided to settle there, but his stay was short, as he drowned two years later. In 1816, the islands were formally claimed by the British Empire and a garrison was sent there. In the following year, the garrison was withdrawn, though three of its members decided to stay on. One of them was Corporal William Glass, who became the island’s ‘governor’. The settlement that was established became known as Edinburgh of the Seven Seas and is situated on the largest lowland strip of the main island. In the decades that followed, the island was inhabited by a handful of people, who were joined occasionally by the survivors of shipwrecks. By 1856, Tristan da Cunha had a population of 71, though many fled in the following year due to starvation, lowering the number of islanders to just 28. By 1886, however, a total of 97 people lived on the island. A major evacuation of the island was undertaken in 1961, when the islanders were threatened by a volcanic eruption . The inhabitants of Tristan da Cunha were evacuated to England via Nightingale. Most of the islanders returned home two years later, though some had died in England, while others chose to settle there for good. Lastly, the lack of human habitation has enabled wildlife to thrive on Tristan da Cunha. In particular, Gough and Inaccessible have been designated as wildlife reserves, and in 1995, were recognized by UNESCO as a World Heritage Site. These two islands are home to species not found anywhere else in the world. For instance, on Gough, there are two endemic species of land birds, along with 12 endemic species of plants, while Inaccessible has two species of birds, eight plants, and at least 10 invertebrates that are found only on this island. Dutra, F. A., 1992. Cunha, Tristão da. In: S. A. Beding, ed. The Christopher Columbus Encyclopedia. New York: Simon & Schuster Inc., pp. 218-219.